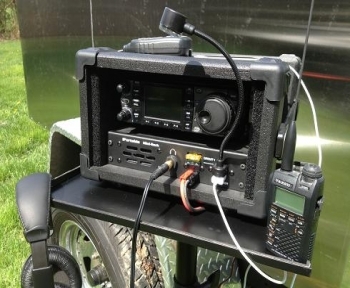 iPortable Rack Systems are the best aesthetic and functional design for portable communications and fieldwork. Perfect compatibility fit of most radio manfacturers. These lightweight yet sturdy racks are the perfect solution for any environment. This rack cabinet is made from DuraGard MDO, Birch, MDF, and Aluminum materials. All cabinet surfaces are sprayed with DuraTex paint products for tough, beautiful, weather resistant surface. Anderson Power poles (AUX 12V@ 30Amps) Front Mounted and fused. Rack Speaker 2.5” Front firing. Audio pre-wired for Radio with 3.5mm plug. Headphone ¼” Jack on front panel (Mutes rack speaker). Rear Storage for power cord / Mics or 12V Lipo battery. Xtreme Rugged Case design with carrying strap. Web order On Backorder ...... Please email to order and establish delivery date.